I'll be honest, my choice is probably due, in large part, to my love and admiration for Helena Bonham-Carter in general because I could never ever forgive Bella for ending Sirius. That being said, HBC's portrayal was absolutely perfect in my opinion - she made Bella impossible to resist. As much as she still terrifies me, watching her fly around the Ministry at the end of OotP, cackling like a real witch ought to always makes me smile! 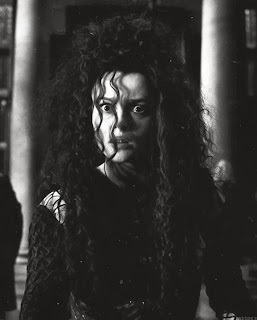 HBC is an amazing actress and I looove how she portrayed Bellatrix, it was spot on. But I am still not Bella's fan. Like you said, she killed Sirius, and she was a tad too crazy for me as well. :D Good pick though! Snap again on this weeks! I have the same as you with admiration to HBC. She is such a stunning and talented woman. I loved reading about this character and I even felt a little disappointed that she was killed even though she was so sadistic! YES! I love Bellatrix! Definitely one of my fav villains if not my top favorite. I loved the actress for the role too she was perfect! Snape is another fav of mine though he's not a true villain I guess after the end. And that cat teacher lady *shoots her in the face*. Helena Bonham-Carter is brilliant, AGREED!! She really brought Bellatrix to life in the craziest way possible. Favourite villain is SO tough because, like you say, Jo is a genius when it comes to creating complex villains that you love to hate. But I think there are none that I love to hate more than Umbridge. GRRRR, that woman was INFURIATING!! Oh man, I think my blood pressure is rising just thinking about her, haha! There is something extra bad about a villain who acts under the guise of someone who is good.